Nail trims are an important part of your dog's basic grooming needs. For many dog owners, the idea of trimming their dogs' nails is followed by a feeling of trepidation. Many dogs also dislike nail trims. Dog nails are constantly growing, just like human nails. 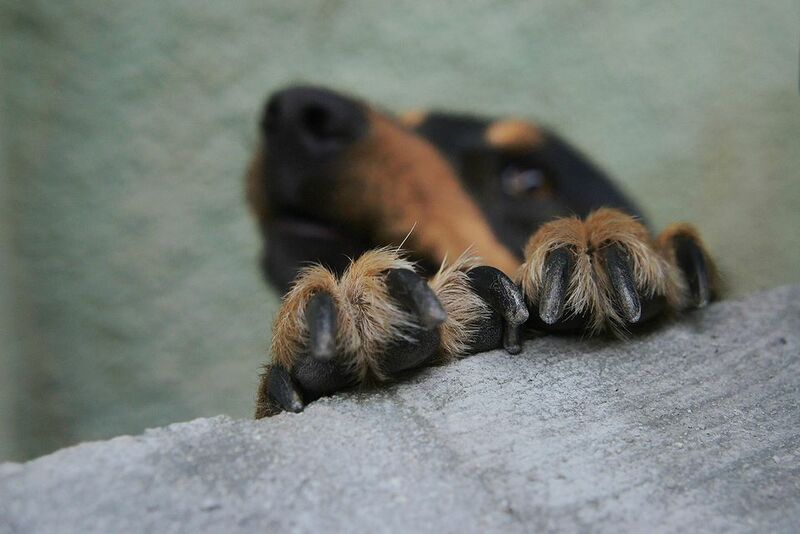 Some dogs wear down their nails naturally from walking on pavement, gravel, or concrete. The majority of today's dogs live indoors and don't spend enough time on these surfaces to keep the nails short. This is especially the case with small dogs. If left to grow, some dogs' nails will curl under and actually start growing into the foot pads. This leads to painful sores and infections. Even if they do not curl under, long nails can make it difficult for dogs to walk, especially on slick surfaces. Finally, long nails can easily get caught on something and become partially torn off or split. This is very painful for your dog. Before you actually begin cutting the nails, you should get everything set up. Find a place where you and your dog are comfortable. There are a few styles of nail trimmer available. The right choice depends on the size of your dog's nails and your own preference. Plier Style Trimmers: These are spring-loaded and the mechanism resembles garden pruners. The small/medium size is great for small and medium-size nails. The large size typically works well on all nail sizes except the very small ones (they can leave the ends of small nails frayed). These are easy to use and tend to stay sharp for a long time, but the blades are not replaceable. Guillotine Trimmers: This has an internal blade and a hole to line up the nail. When the handle is squeezed, the blade comes up to trim the nail, kind of like an upside-down guillotine. Many beginners find this type of trimmer very easy to use. It's important to know how to hold the trimmer in the correct manner so that it works properly. The handle should be down below the dog's paw, with the nail hole at the top. The screws on the trimmer should be facing towards your dog. The nail should then be lined up inside the hole at the right spot to make the cut. The internal blade on guillotine trimmers can be replaced when it becomes dull. Guillotine trimmers work best for small to medium size nails. They are not ideal for very large or very small nails. Scissor Trimmers: These trimmers work just like a pair of scissors. Rather than a flat cutting surface, they have a curved blade to cut the round nail. Simply line up the blade with the nail at the appropriate spot and make the cut. These trimmers are only useful for smaller nails, as they are typically not strong enough for the larger nails. Metal Hand File or Power Rotary Tool: If your dog will tolerate it, you can use one of these tools to smooth the rough edges after the nail is trimmed. Once you are in a good position, you can begin cutting the nails. Grasp your dog's paw firmly, but without squeezing. Hold the trimmers with your dominant hand and grasp the paw with your other hand. Place your thumb on the bottom of the foot pad and your fingers on the top of the foot near the nail bed. Line up your trimmers by placing the edge of the blade upon the nail at the imaginary "cut line." Squeeze the trimmers in one swift, deliberate motion. Avoid cutting if the dog is moving. Grab your styptic powder, or use some cornstarch or flour if you don't have styptic powder. Use a cotton ball, tissue, or paper towel to wipe away as much blood as possible. Get a pinch of the powder and quickly pack it onto the nail tip. Give your dog a break and reward before moving on to the other nails. Though cutting into the quick does cause sharp pain, it is not long-lasting and should not affect your dog's ability to walk. Some dogs will simply not stay still for nail trims, even with extra people helping. You can try working with your dog to gradually desensitize it to the nail trims. Reward the dog if it tolerates minimal paw handling, then gradually work your way up to nail trims. If your dog is trying to bite you or is fighting so hard, it could injure you or themselves, then the nail trim is a job best left to the professionals. Fortunately, most vet offices and groomers charge a minimal fee for basic nail trims. In extreme cases, sedation may be needed to trim nails.